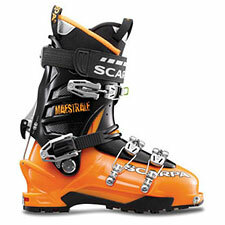 Scarpa's 4-buckle Maestrale ski boot strikes me as the true successor to the original Alpine Touring champ, the venerable old Garmont Mega Ride. While current trends in A/T gear have led steadily to ever-heavier boots, the Maestrale enters the game at a stunning six pounds, fifteen ounces (size 27.0, with included footbeds, measured)—staying under that critical 7-pound barrier. Take a look at the Maestrale and marvel at the effort and ingenuity Scarpa has shown in keeping the weight down: magnesium buckles, shell cutaways, a shaved sole! But the critical question, as always, is: how does it ski? To keep things fair, I decided to ski the Maestrale head-to-head against its closest competition (in terms of weight), Garmont's 3-buckle, 7-pound Helium. Note that the Helium is an overlap boot, whereas the Cabrio-constructed Maestrale employs a hinged, asymmetrical tongue. I won't keep you in suspense: on hard snow, the Maestrale was the clear winner of the showdown, easily besting the Helium's edging power and control. Elsewhere, across a variety of turn shapes and snow consistencies, the Maestrale roughly matched the Helium's smooth, progressive ride, making for a subjective toss-up. Be aware that you will need to crank the Maestrale's top buckle and power strap down to achieve a good forward flex profile. Left loosely buckled, the Maestrale has quite a bit of play in terms of forward motion, which can disrupt the proprioceptive feedback your brain needs to feel connected to the snow. Be aware also that cranking those buckles down brings reduced comfort—the boot gets a little pinchy around the shin. Obviously, you won't want to leave the boot cranked down continuously. Other reviews have noted that the Maestrale's asymmetrical hinged tongue is awkward and annoying. Did I notice this? Absolutely. Did it bother me? Not in the least. However annoying you find the tongue to operate (or not), you're still left with a snappy 4-buckle ski boot that weighs less than seven pounds. So, no complaints from me on usability. When it comes to climbing and touring comfort, the Maestrale is quite simply dazzling. The cuff releases in Walk Mode with a huge range of motion, augmented by the extra forward play. The boot manages to simultaneously offer a low/medium volume fit and a roomy toebox, perfectly matching my foot and my needs. As with most Scarpa ski boots, you also get a huge degree of user-friendly features, allowing you to tweak and customize the hardware to your heart's content. I don't have objective data here, but I am sensing that Scarpa has reduced the profile of the last's interior 'hump' which typically interferes with custom orthotic fitting. The boot bed seems flatter to me compared to previously-tested Scarpa models (though not perfectly flat), roughly akin to the profile of the Garmont Helium. Included with the Maestrale is Intuition's Pro Flex G thermo-formable liner—not a wraparound, but fully laceable if you choose. How do I see the Maestrale overall? The downhill performance isn't in the same class as Garmont's Radium or Black Diamond's Factor, so for absolute riding chops (especially on bigger skis), you'll want to look to a heavier boot. But for pure Alpine Touring/Ski Mountaineering needs, especially all-out 24-hour summit assaults like a Tyndall Death March, the Maestrale reigns supreme. A very worthy Cabrio successor to the Mega Ride.